Luxury meets performance when you slide into the driver's seat of the award-winning Jaguar F-PACE luxury SUV at Barrett Jaguar. Despite a stellar reputation, the Jaguar favorite will get an upgrade with the release of the 2019 Jaguar F-PACE in the summer of 2018 and many luxury car buyers want to know – what are the differences? Take a closer look with this 2019 Jaguar F-PACE vs 2018 Jaguar F-PACE comparison. When it arrives at Barrett Jaguar this summer, the 2019 Jaguar F-PACE will build on an award-winning design with the addition of a track-ready, performance-tuned F-PACE SVR trim level that was developed by Jaguar Special Vehicle Operations. With the addition of the Jaguar F-PACE SVR, luxury car buyers will have a choice of seven trim levels – F-PACE, Premium, Prestige, R-Sport, S, Portfolio and SVR. Jaguar F-PACE variants make room for five passengers and add 33.5 cubic feet of cargo space. What Are the Differences Between the 2019 Jaguar F-PACE and 2018 Jaguar F-PACE? An expanded model lineup is just one highlight of this 2019 Jaguar F-PACE vs 2018 Jaguar F-PACE comparison at Barrett Jaguar. With the arrival of the 2019 Jaguar F-PACE SVR, the Jaguar-brand crossover adds incredible power and performance. 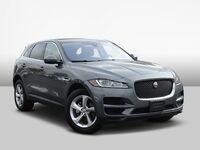 In the previous generation, the Jaguar F-PACE S resided at the head of the class with a 380-horsepower 3.0-liter supercharged V-6 that led to a 5.1-second zero to 60 mph time. Drivers who crave even more power and speed will find what they are looking for when they slide into the driver's seat of the 2019 Jaguar F-PACE SVR. Powered by a 550-horsepower 5.0-liter supercharged V-8, the F-PACE SVR will sprint from zero to 60 mph in just 4.1 seconds with a top speed of 176 mph. Highlights of the performance-tuned Jaguar F-PACE SVR include an aggressive, aerodynamic style package, a track-tuned suspension system, lightweight 22-inch forged wheels, performance brakes, a Variable Valve Active Exhaust System and a SportShift Gear Selector. All of the elements that have made the Jaguar F-PACE a fan favorite in the past remain in the rejuvenated 2019 Jaguar F-PACE. 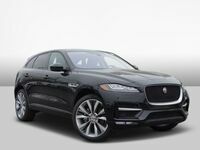 A luxurious cabin provides standard LuxTec synthetic leather interior, a panoramic sunroof, an 11-speaker and 380-watt Meridian™ sound system, a power liftgate and an 8-inch Jaguar InControl Touch™ infotainment system. Upgrades to the Jaguar F-PACE cabin include premium leather upholstery, onboard 4G Wi-Fi that will support eight mobile devices and a 12.3-inch Interactive Driver Display. Visit Barrett Jaguar in San Antonio this summer to test drive the Jaguar F-PACE luxury crossover!